The applet below contains a quadrilateral that ALWAYS remains a kite. The purpose of this applet is to help you understand many of the geometric properties a kite has. Some of these properties are unique and only hold true for a kite (and not just any quadrilateral). The questions you need to answer are displayed below this applet. 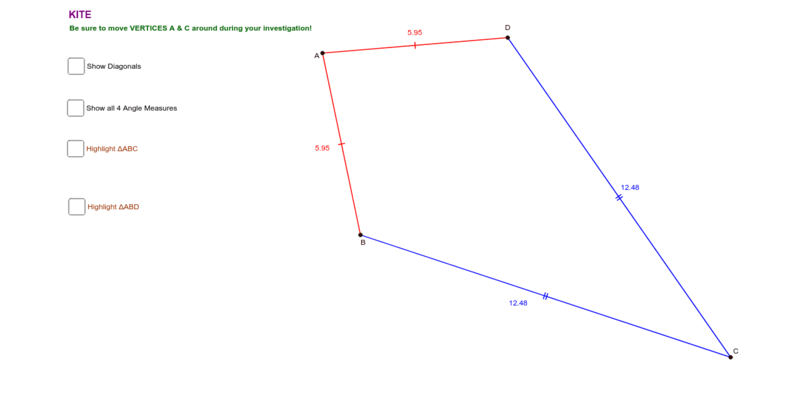 Use the tools GeoGebra within this applet to investigate the answers to the following questions: 1) Is a kite a parallelogram? 2) Is a kite a rhombus? Explain why or why not. 3) Are OPPOSITE SIDES of a kite congruent? If so, how many pairs? 4) Are ADJACENT SIDES of a kite congruent? If so, how many pairs? 5) Are any pairs of opposite angles of a kite congruent? If so, how many pairs? 6) Do the diagonals of a kite bisect EACH OTHER? 7) Does either diagonal of a kite get bisected by the other diagonal? If so, which diagonal gets bisected? 8) Does any diagonal of a kite bisect a pair of opposite angles? If both diagonals don't do this, does one diagonal do this? If so, which diagonal? 9) Are the diagonals of a kite perpendicular? 10) Are the diagonals of a kite congruent? 11) Does either diagonal of a kite serve as a line of symmetry? If so, which one(s)? 12) Is a kite a rhombus? 13) What properties do a kite and a rhombus share (have in common)?